Minimal Plus is the railing for indoor stairs that combines functionality and safety with a simple and linear design. Born as an evolution of Minimal, from which it inherits the design, Minimal Plus differs by a strong attention to safety which translates into the presence of a greater number of linkers or, optionally, into the adding of glass panels between the pillars. It is not always easy to associate high safety to a clean and minimal design. 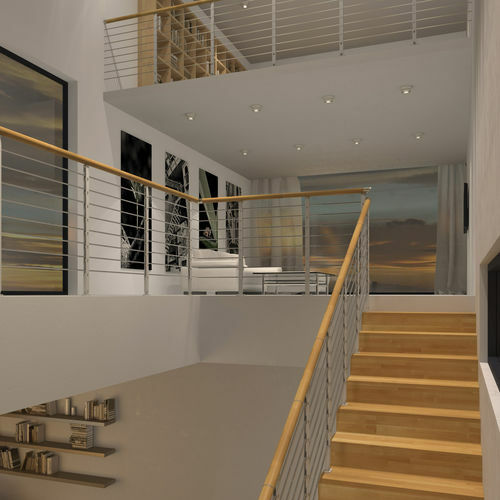 It is this aspect however that characterizes Minimal Plus and sets it apart from regular railings for indoor staircases that make safety their main feature. The design of the blades in painted steel, which make up the pillars, retain the same simple lines that distinguish Minimal, allowing the railing to harmonize with the environment in which it is inserted. Compared to its older sister and to most of the railings for indoor staircases, Minimal Plus fits double the number of linkers. 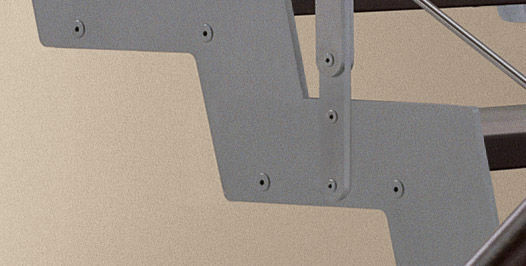 The posts are in fact connected by 8 hard linkers, 12 mm in diameter, of brushed stainless steel which eliminate all openings greater than 10 cm and make it the ideal solution for those homes where the need for safety on a railing for indoor stairs is paramount, for example where children run free. 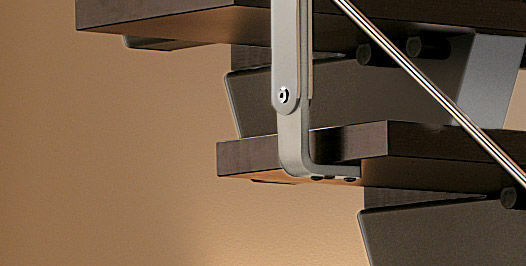 Optionally, you can replace the linkers with glass panels supported by clamps attached to the posts themselves. The handrail can be made either in wood, coordinated with the steps or the coating, or in stainless steel for a modern railing.